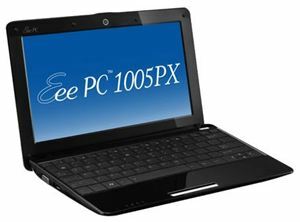 Asus has added a new model to its netbook lineup which is named as Asus Eee PC 1005PX. The new machine has been featured with 10.1-inch LED-backlit matte display for better view in direct sunlight. The Asus Eee PC 1005PX is powered by Intel Atom N450 processor and runs on Windows 7 Starter or Windows XP Home. The battery of the netbook has been improved to provide up to 8.5 hours of battery life for users who frequently travel. Display: 10.1-inch LED backlit WSVGA Non-Glare Screen with 1024 × 600 resolutions. Operating systems: Windows 7 Starter or Windows XP Home. Memory: SO-DIMM 1GB or 2GB. Wireless: WLAN 802.11 b/g/n and Bluetooth v2.1 + EDR. Hard disk: 2.5-inch HDD 5400rpm SATA2 160GB, 250 or 320GB. Card reader: suuports MMC or SD (SDHC). Others: 2x USB 2.0, 1x audio jack, VGA connector, built-in MIC and speakerphone. Available in black, white, blue, pink and red, the price and the availability of the ASUS Eee PC 1005PX with dimensions of 262 x 178 x 25.9~36.5mm and weighs 1.27g are not yet announced.